It’s the first Saturday in September, on a mercifully cool Texas summer morning. I’m sitting under a gnarled old pecan tree, plump with nuts, watching a remarkable event unfold before my eyes. A man I know through swimming is celebrating his 10,000th swim in a row with a 10,000 meter swim. No, I didn’t mistakenly add an extra zero or two. Also, he’s 68-years old. I hope I’m half as fit as he is when I’m 68. Supportively sitting by the side of the pool, his wife smiles while counting and logging lap times. She holds up fingers every 1000 meters while walking the length of the pool, letting him know how far he’s swum. The strokes and flip turns of countless fellow swimmers and friends create a rhythmic, comforting churn of the water. From my vantage, I see at least six friends taking photos and video with their phones. News reporters arrive one after another to cover the story. The swimmer even set up a fundraiser for a favorite cause to celebrate his astonishing and audacious milestone. Swimming 10,000 days without a break? It’s a remarkable accomplishment by any objective measure. Who am I to judge and label such a grand achievement? It’s perfectly well suited to him. 10,000 days equals 27.5 years with not one day off. My own questions center on the choices and goals we create, how we live our lives, and what’s important to us. When do our goals morph into obsessions? Let’s admit most athletes have an obsessive streak, especially injured athletes, who run around in tight circles like high strung border collies, anxious to return to their sport. Obsessions and obsessive goals. I see it all the time with clients. One set his sights on a fabricated and misguided obsessive end goal–getting off crutches as soon as possible after surgery. Another client decided she was well enough to start training for a mountain climb she had set her sights on immediately post-injury–to hell with considering what her body could handle. Predictably, the quest to achieve these goals led to agonizing setbacks that only lengthened their recovery time. If you allow them, your goals take on a life of their own, insidiously mutating into burdens and obsessions. Perhaps you’re telling yourself you must take more steps today than you did yesterday or lift more weight this week than you did last week. If you don’t ride the exercise bike at physical therapy 30 seconds longer each day, you’ve failed. We all have our own recovery goals. When chosen right, such goals help us stay focused and allow us to measure, and feel good about, our accomplishments. A goal becomes obsessive and burdensome when you start making choices (read: bad decisions) you wouldn’t make were there not a streak to maintain. I’m going to use swimming 10,000 days in a row as an allegory; you need to pick your own obsessive goal, ask analogous questions, and come up with your own answers. What about getting sick? You’ve got the flu and you feel like a pile of steaming horse poo. 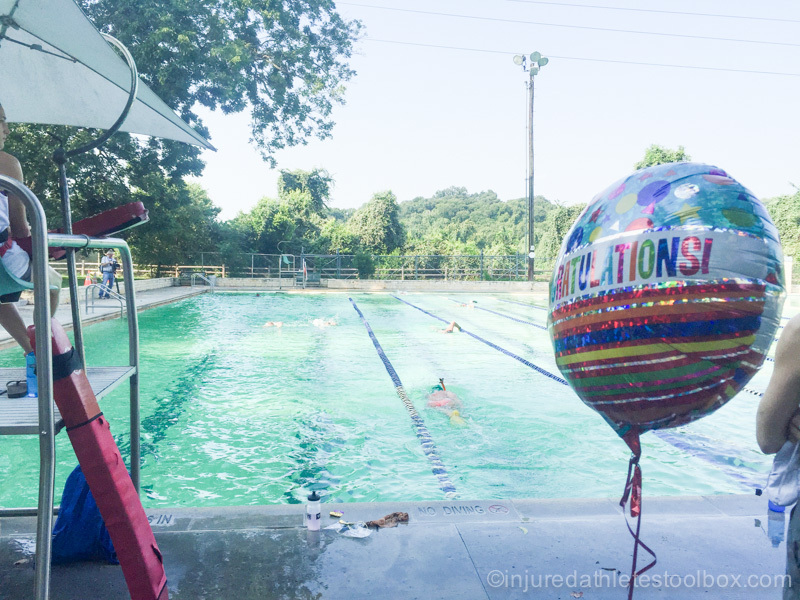 You’re probably contagious and you swam yesterday, but you’ve got 9842 days behind you and you know you can hit 10,000 by the end of the year, so you go to the pool anyway. You’ve created a burden on your psyche and a risk to yourself and others. The streak supersedes taking care of yourself. This swimmer was in the water swimming laps the day after arthroscopic knee surgery. His doctor told him he would be out of the water for a number of days as the wounds closed. His response: You don’t understand. Find a way to wrap up my knee and make it work. So, the day after surgery and anesthesia, he was at the pool with his knee wrapped up in a waterproof bandage. Again, the streak superseded self-care. If he hadn’t had so many days of consecutive swimming behind him, would he have swum that day? Was he thousands of days in at this point and couldn’t bear the thought of a surgery throwing off his streak, so he hauled himself over to the pool and he swam anyway? What if it was a shoulder injury? Would he have sidestroked for months? I don’t know how he would answer these, and doesn’t really matter. We each need to have our own answers. For most people, there are going to be days where it doesn’t make sense to feed your obsessions, and, if you continue to do so, the burden anvil will continue to bear down. The nefarious nature of a streak is that it’s consecutive days. There’s no opportunity for relief. In the swimming example, he couldn’t be away from a pool for more than 48 hours. What if he wanted to go to the West Texas desert, or backpack in the Rockies, but there’s this thing looming–the streak? It has gone on for so long and has a life of it’s own now. He can’t let go of it. So then he can’t go to the desert unless he finds a Holiday Inn with a pool, all the while praying it doesn’t close because of a chlorine imbalance. He has to keep swimming every day without fail or it’s over. That’s a huge decision that has essentially become a decades-long burden. Maybe for some people a streak is psychologically helpful, but for most it’s a psychological burden. You don’t want to be responsible for your own psychological burden. You probably have a lot of life burdens that resemble goat rodeos already. Don’t create another one out of whole cloth. Having an obsessive goal requires you to make extreme and often questionable choices. When you’re injured, such poor choices result in a cycle of re-injury, setbacks, and more obsession. See what’s happening? The obsessions lead to more obsessions. Then, our obsessive goals become things unto themselves, beings almost. They become bigger and more important than the actual goal…recovery. Are you feeding a being that’s getting bloated and more demanding? I’m not suggesting we shouldn’t have big goals and make sacrifices to achieve them. That works sometimes, but it doesn’t necessarily work for all people at all times and places, particularly if you examine things you have to miss out on and make questionable decisions to keep it going. Check in with yourself. Question the sanity of your injury recovery decisions and examine your goals. Are they obsessions? Are they burdens? I’ve tried to imagine how the swimmer would answer these questions. He has all the education and professional background for self-reflection. He is, after all, a psychologist. Having swum at least 1000 yards a day for 86 straight days, the thought of 10,000 days is even more daunting than if I had done zero. That’s because — far more than the mere ability to swim once a day — the living of a life threatens the streak more than anything else. I have managed to fit daily swimming well into the framework of a daily, weekly and monthly routine, but the rest of the time — disposable time — is valuable to my loved ones as well as to me. When I spend it alone, staring at the black line on the bottom of a pool, I take from my wife and my son and my friends and family. Mostly, it’s time they weren’t able to use anyway, and won’t notice. But a tension grows. They are very supportive, but when the critical showdown arrives, the streak must not survive. It is very useful to me, however. It’s like an ocean wave, carrying me toward solid ground, and I want to ride it as far as I can. When I started it, I had ephemeral goals, no fitness and little willpower. The streak was and is a prosthetic for atrophied motivation. Now that I’m enjoying the physical and psychological progress that comes with swimming every day for three months, other motivations are taking over. I’m starting to think about the value of rest. I don’t wonder if or how I’ll keep the streak alive over the summer, because I know it will be gone by then. It does take on a life and a momentum of its own, however. My wife is blessedly vigilant and wary of obsessive behaviors, even “healthy” ones, because their interactions with the world are the same as those of a weakness. I’m more susceptible, obviously, so I keep my eye on her, my lodestar. Recently, we talked about the end of the streak. I am currently in a career transition, looking for a counseling job after finishing my masters degree. So I decided that a new job in the new career would be an honorable altar upon which to lay my swimming streak. I will continue to try to swim every day, but the first time a new job opportunity puts the squeeze on my swimming time, she and I will drink a toast to victories won, and turn the page. I can’t tell from the story, but I hope the 10,000-day man and his wife constructed this accomplishment together. Certainly, each of them sacrificed, along with countless unnamed others. I also wonder if they know how it’s going to end. If I were him, I would try to finish it on my own terms, like euthanizing a faithful old dog. You don’t want it to get hit by the car, or to crawl under the porch to die alone. Thank you for your very thoughtful and eloquent comment, Sean. I wrote this blog so we can all take a look at our goals and question whether or not they are morphing into obsessions. It sounds to me like you’ve looked at all angles of your streak and how it affects (or doesn’t affect) you and your family. I think my favorite line in your comment is, “They are very supportive, but when the critical showdown arrives, the streak must not survive.” Most people allow a streak to supersede other important things/events/people in life. 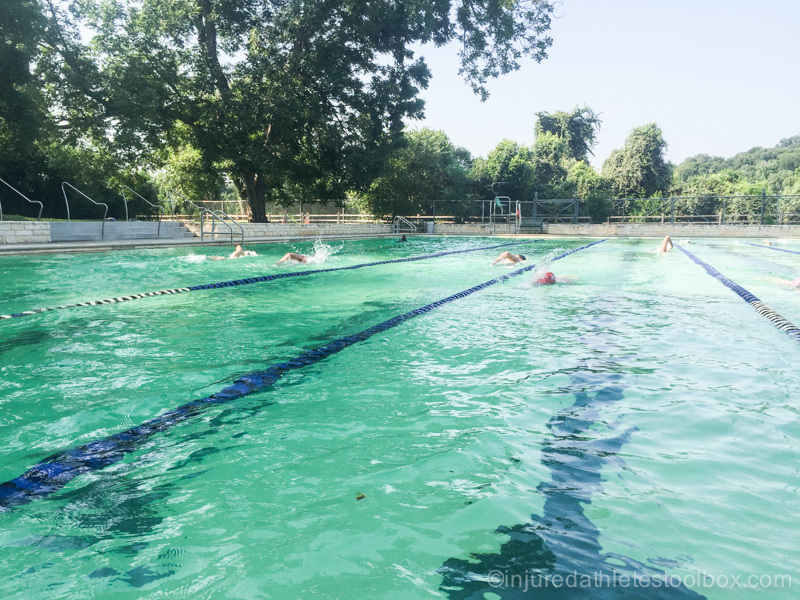 I had a 70-something day swimming streak last summer, and I felt a lot like you about it…it carried me toward solid ground and fitness. Like you, my streak was a prosthetic for atrophied motivation too. I’m actually feeling like a mini-streak might be helpful right now. It sounds like your wife is a remarkable spirit and someone who keeps you (and people like us) grounded. I’m wishing you all the very best for your career transition. If you have a website–or when you do–will you please email me at [email protected] and let me know what it is. I don’t know if the 10,000-day man and his wife constructed his accomplishment together; it seems almost impossible that it couldn’t have happened without both of them cooperating–but that’s just an assumption. I do know she was delightfully supportive on the 10,000 day. Then…you pose the most interesting question–when will it end? I have no idea.